Atop the hillside, stands the uniquely designed Hexenagger Castle overlooking the town of Hexenagger in Bavaria, Germany. The Hexenagger Castle in the town of Hexenagger, Bavaria in Germany is a location that is used for many special festivities and celebrations. During the Christmas season, a beautiful market is set up which is open for three weekends prior to Christmas Day where people can take in the beauty of the "Schloss Hexenagger Winter Magic Land". Other events that take place in the Hexenagger Castle are the "Garden and Nature" show which happens during the Spring season. There is an ever changing venue at the castle which brings out the crowds due to their popularity and success.The Hexenagger Castle in Bavaria, Germany was mentioned years ago in some of the historical books which date back to 982. The royal family of the Weidenbach, has been part of the Hexenagger Castle since the year 1834. 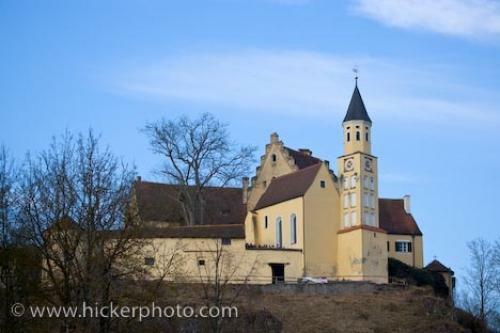 Photo of the historic building named the Hexenagger Castle in the town of Hexenagger, Bavaria in Germany, Europe. Pictures from photo gallery "Bavaria Pictures"
This picture is part of the photo album "Bavaria Pictures" - there are more beautiful images waiting for you. ... Every event at the Hexenagger Castle in Bavaria, Germany is carefully thought out making these special occasions fun for the entire family. Not only can you browse through the market stalls, you will be able to really admire the stunning architecture of the Hexenagger Castle. Hexenagger Castle (Palace), Schloss Hexenagger, in the town of Hexenagger, Bavaria, Germany, Europe. I photographed this photo with the digital SLR camera model Canon EOS-1Ds Mark II, aperture of f/5.6, exposure time of 1/400 sec. on ISO 100, as always I used a original Canon Lens, the focus lenght for this picture was 115mm.